This 'Spinach layered potato cake' not only looks impressive. It was delightful to slice into, as well as eat. It held its shape well and the flavour of the spinach came through good and true. I think it would be excellent for cold buffets and picnics. I used my mandolin slicer to make this. It made such easy work of slicing, but please whatever you do, don't get distracted and lost in the gentle rhythm as this could awaken you with a sudden and deep cut from the sharp blade - ouch! Also when baking this potato cake in the oven, it needs a long while to cook. Its not particularly pleasant chomping into a raw potato slice. So if you decide to make this, please please be patient. For this reason too, this is not a working week meal (unless of course you've prepped it in advance). Its more suited for long lazy weekends. This is not a working week meal (unless prepped in advance). Its more suited for lazy weekends or an evening when you want to impress. 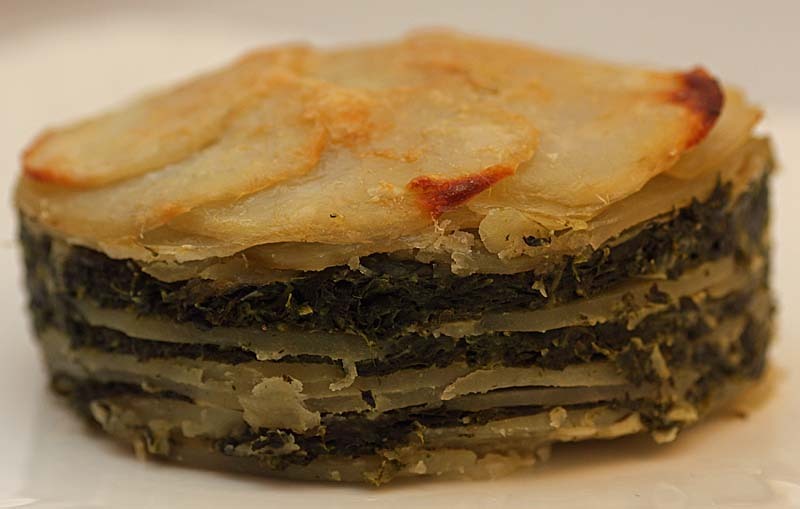 This 'Spinach and potato layered cake' was served with a Lemon-Dijon cauliflower salad. The cauliflower has a lovely mustardy kick to it. Heat oil in a wide pan, add in the garlic and the spinach and cook until the spinach has wilted.. Drain well and squeeze out any excess moisture. Chop finely. 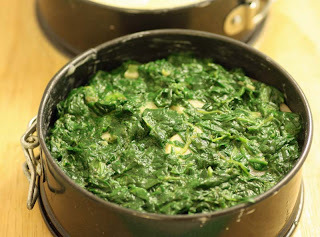 Beat the eggs with the cream, stir in the chopped cooked spinach and season well. 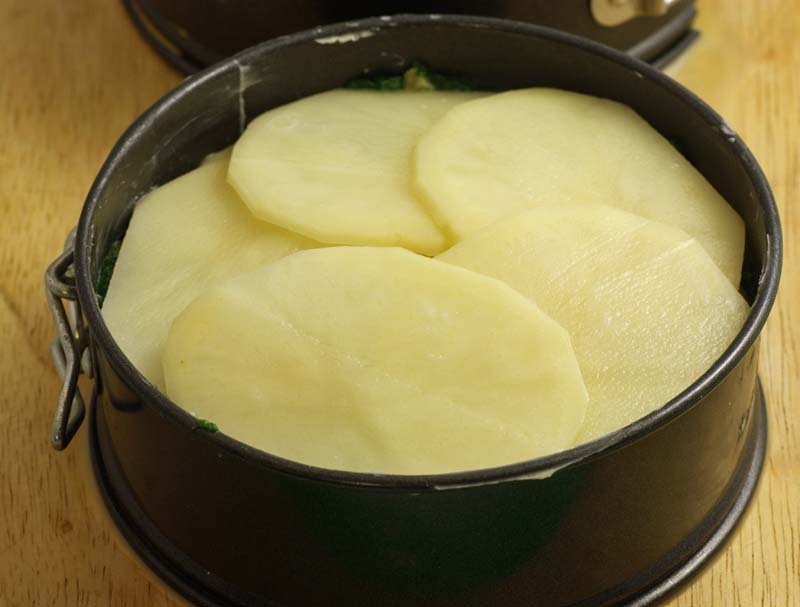 Cover the base of an 8 inch cake tin with a layer of potatoes and spread evenly with a spoonful of the cream and spinach mixture. 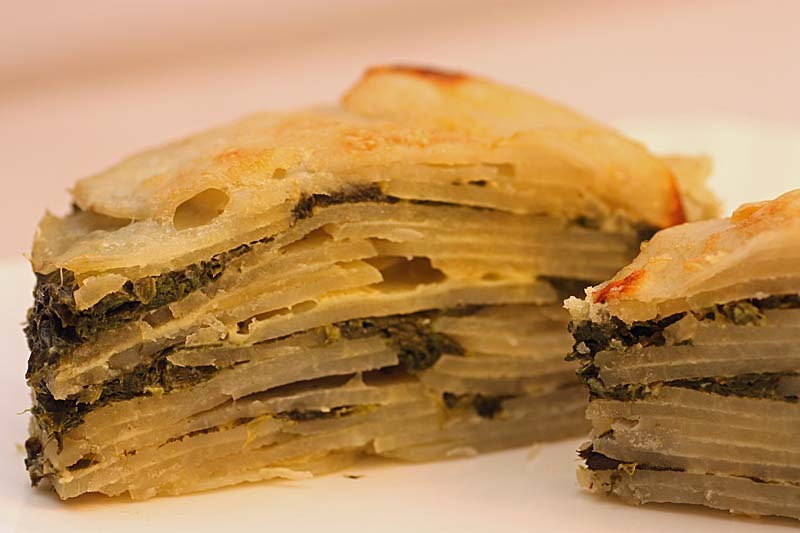 Continue layering, finishing with a layer of potatoes. Sprinkle with the Gruyere cheese, then cover the tin with a piece of foil. Put the filled cake tin in a roasting tin and pour around enough boiling water to come half way up the sides. Carefully put in a preheated oven and cook at Gas Mark 4 for about 1 1/2 or until the potatoes are tender - test by piercing the centre with a knife or skewer. Remove the foil for the last 15 minutes to allow the top to golden. Turn out onto a plate and serve hot or cold. Scrumptiously delightful! Looks a bit labor-intensive or am i mistaken? This looks like a fantastic dish. The flavors seem deep and wonderful. Thanks for posting! Oh that potato cake looks lovely! That looks lovely MC, I am a huge fan of anything potatoey. I have a mandolin slicer too, I might give this one a go this weekend. Is it a heavy dish, like traditional potato bake? Thank you Priya of Now Serving. It does take a little time, but its worth the effort. As long as you portion control :0 ) then No, its not heavy. Actually, its not heavy at all and is best served with light accompaniments. This is really gorgeous! I love the way it looks, especially the side view. Beautiful...I'd like to try this recipe. Do you think it could be adapted to a slow cooker? And is there anything lower calorie I could substitute for the double cream! I realize that changes will make it look and taste somewhat different but the potato and spinach would still be wonderful! 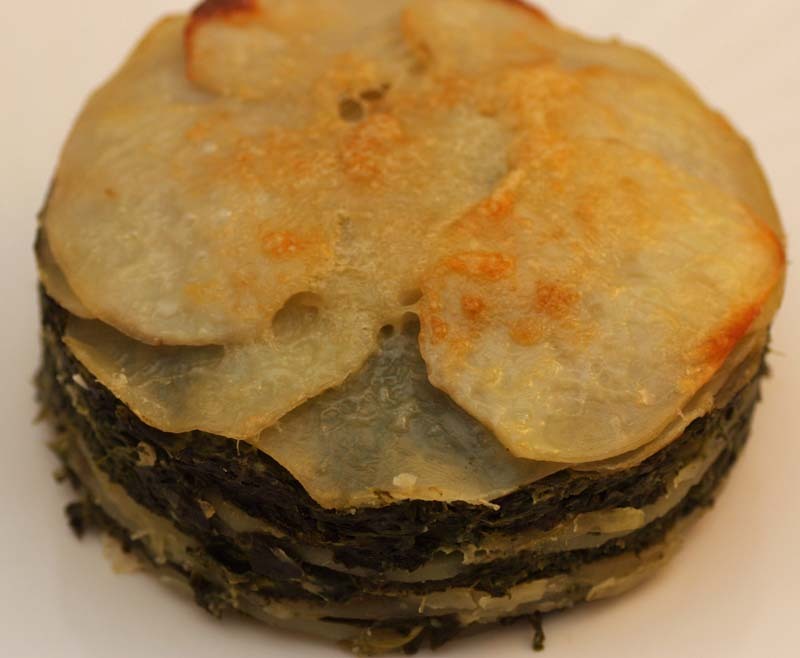 Oooh, love the potato cake with spinach. 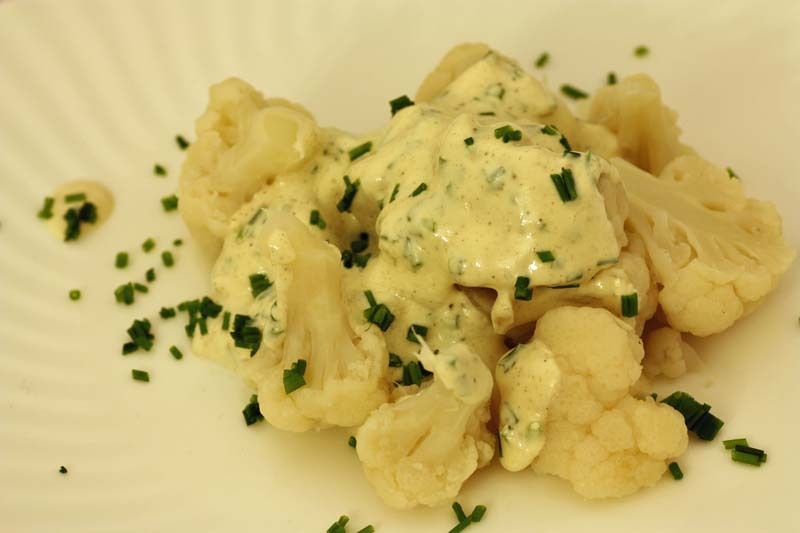 And your Lemon-Dijon cauliflower salad sounds great too! they look superb and really pretty on the cut sides. good job there! Very tempting recipe! I love all the ingredients you used! Once sliced - it certainly is quite effective. Yes, I think it can be made in a slow cooker, but I'm unsure how it would come out with the same layered effect perhaps being lost, but if its about flavour then I am sure it will be fine. The Lemon-Dijon cauliflower salad was really a nice accompaniment! Its worth the time to make this when you get pretty cut sides. 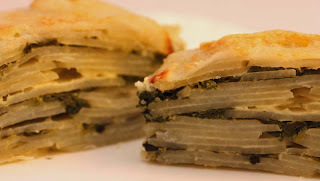 Potatoes and spinach together?? Well, that's just perfect! Thank you so much Chilean woman. OH MY GOSH! This looks SO delicious! You have such a wonderful blog that you are clearly so passionate about, it's the best kind of inspiration. Also, I need to make that. Thank you so, so much 20 Something. This looks so yum. I love potatoes and spinach so I reckon Im on to a winner here.